Airmail was found in 1918. 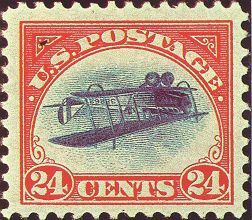 For years the newspapers and the philatelic press of this and foreign countries have told many stories of the discovery of the sheet of one hundred twenty-four cent Air Mail stamps with the center inverted. At this time these stamps are considered one of the rarest items of all stamps that have been issued by the United States as well as foreign countries. The last price seen by the writer was $3,900.00 for a single copy. During all of these years that have passed since I purchased these stamps I do not recall having seen an article that has given all of the details connected with the purchase and sale of the sheet. I have often thought that I would like to write all of these details in order that many of the present and all future generations of philatelists may know these facts. I have decided to acquaint the philatelic world with the details. Nearly twenty years have passed since that memorable Tuesday of May 14, 1918, when the sheet of one hundred of the twenty-four cent Airmail stamps with the center inverted were passed over the window to me here in Washington, D. C.
In those days the issuance of a new stamp was a rarity and the cause of much comment in philatelic circles. It had been announced that the new stamp would be in tw~ colors and the possibility of an invert was the cause of much widespread discussion. Just a short time previous to this the famous five-cent error had been discovered and the possibility of an invert slipping past the watchful eyes of the inspectors in both the Bureau of Engraving and Printing and the post office led us collectors to feel that I?uch a possibility was greater than ever. This country at that time was in the World War and the Bureau of Engraving and Printing was working twenty-four hours a day printing Liberty Bonds and new currency, besides stamps. Upon asking for these stamps, the clerk on duty told me that he only had a very few of them but was expecting another consignment abput noon of that day. I examined the stamps that he had on hand but due to the poor centering decided to wait until noon before making my purchase. Promptly at noon, I returned to the post office with $30.00, which I had previously withdrawn from the bank. The same clerk was on duty at the stamp window and upon inquiring as to whether he had received any additional copies of the Air Mail stamps, he reached down under the counter and brought forth a full sheet and my heart stood still. It was the sheet of inverts. It was what you might call a “Thriil that comes once in a lifetime.” Without any comment, I paid for the sheet and then asked the clerk if he had any more sheets. He again reached under the counter and brought up three additional sheets which he said were all he had. An examination showed these sheets to be normal. Had they been otherwise, I wonder how I would have paid for them with only $6.00 in my pocket? I handed these three sheets back to the clerk and then showed him the sheet that I had purchased and drew his attention to the fact that the airplane was upside down. Without any comment he left the window and ran for a telephone. Needless to say, I left that office in a hurry with my sheet of inverts tucked safely under my arm. The thought then struck me that possibly there might be more of these stamps in some other branch office and I hurried to the Eleventh Street branch, about six blocks away. An examination was made of all of the stock on hand, but failed to reveal any inverts. Feeling highly elated, I returned to my office to show my fellow worker and collector what I had discovered. He immediately left to make a search of the other branch offices. Then telegrams were sent to friends in both New York and Philadelphia apprising them of my find and giving them the plate number of the sheet. Next I called the office of Mr. Colman on the phone. He was not in, so I told Mrs. Manning what I had discovered, but for some unknown reason she would not believe me. In all of the conversation had’ with the clerks in the different offices, I never gave my name, yet, within one hour after my return to work, two postal inspectors called to see me. Upon investigation, I found that my fellow worker had given my name and address during his visits to the different branch offices. The visit of the postal inspectors proved to be a very interesting one. At first they wanted to know if I had purchased the sheet of the twenty-four cent Air Mail stamps with a purported inverted center. Upon informing that I had, they asked me to let them see it, which I refused to do. Well, the conversation was hot and furious from then on and ended in their making the statement that the Government would confiscate the sheet. This in no way intimidated me and I informed them that they had said enough. Also, I said that “...before they tried to confiscate the sheet which I had purchased at the face value from the post office, they had better start con:t;iscating the 1869 inverts, the Pan-American inverts, and all of the five-cent errors. After securing them, it was then time to talk about confiscating my property.” No doubt, a novice might have been scared into relinquishing the sheet. Later that afternoon Mr. Colman came to my office to see the sheet and offered me $500.00 for it. I refused to sell and he informed me that he did not blame me. After work, I took my precious sheet and went to Mr. Colman’s office. Present at that time were Mrs. Manning, Mr. Colman, Mr. Leavy, besides other collectors. All examined the sheet but no one would place a possible value upon it. Mr. Leavy stated that as the stamps were printed in sheets of 400 subjects, it was apparent that there were at least three other similar sheets. History tells us that three more sheets of these stamps were found in the Bureau and promptly destroyed. At that time, the late Percy Mann of Philadelphia, was conducting the new issue column of Mekeel’s Weekly. A telegram was sent him about the find, requesting him to give proper notice of same in his column. The next day, a reply was received from Mr. Mann, in which he stated that he was coming to Washington that day and would call on me that evening. After making an examination of the sheet, Mr. Mann stated that he was prepared to offer me $10,000.00 for same and would I accept that sum? I told him that I had made up my mind to go to New York and see what I might possibly get for the sheet there. He then requested that if, in the event his offer was equaled, or bettered, by anyone in New York, that I inform him of such either by phone or telegraph and givehim the opportunity to make a further bid for the sheet. This I promised to do. During the course of my conversation with Mr. Mann, I learned that the sale of these stamps was stopped in both New York and Philadelphia for over two hours on the previous day and that collectors and dealers were at a loss to understand why. After the receipt of my telegram he said that he readily understood why the sale had been temporarily stopped. The next day was Friday, and as previously arranged, I left for New York that afternoon, arriving about 9 P. M. A waiting me at my hotel were Percy Doane, the well known dealer, and Elliott Perry, “Himself.” My fame had preceded me and naturally they wished to see the sheet. I was asked by them if any offer had been made for the sheet, and I informed them that I had refused $10,000.00. Bright and early the next morning, I started out to try my luck in disposing of the sheet. My first stop was at the office of the ultimate buyer, Col. E. H. R. Green at 111 Broadway, where I was informed that he was out of the city. Next, I went to the office of Stanley Gibbons, which was at that time managed by Mr. Eustace B. Power, who has frequently condemned all Twentieth Century issues of stamps. At that time Mr. Power was a great humorist. Imagine him offering $250.00 for $24.00 face value of “Twentieth Century trash.” He also stated that he knew of three other sheets of these stamps and was negotiating for the purchase of same at that time. Wonder why he never bought them? Later, I went to the office of the Scott Stamp & Coin Co., who only wanted to dispose of the sheet on a commission basis, refusing to make a cash offer. Feeling rather low and disgusted with my failure to secure a decent offer for tl1e sheet, I returned to my hotel and found waiting for me, Mr. John J. Klemann, who after examining the sheet offered me $2,500.00 for it. When I told him that I had already refused $10,000.00 for it, he stated that I was crazy and anyone offering such a price was also crazy. That evening I phoned Mr. Mann in Philadelphia and told him that I was returning to Washington the next day, that while his price had not been equalled in New York, I had decided not to sell the sheet at that time. He asked me if, on my return to Washington, I would mind stopping off at Philadelphia and have a lurther talk with him. This I agreed to do. Upon my arrival in Philadelphia, I was met at the station by Mr. Mann and was immediately taken to the home of Mr. Eugene Klein. Mr. Klein, after looking at the sheet, asked me to set a price on it and I told him I would not accept less than $15,000.00 for it. After a consultation with Mr. Mann, Mr. Klein requested me to give him an option on it at $15,000.00 until 3 P. M. Monday, which was the next day. To this I agreed and then left for home. Bright and early the next morning, I received a phone call from Mr. Colman, who asked me if I would accept $18,000.00 for the sheet. I told him that I had given Mr. Klein an option on it until 3 P. M. and if he did not exercise same by that time I would get in touch with him. Shortly before the expiration of the option, I received a phone call from Mr. Klein agreeing to purchase the sheet at the agreed price, namely $15,000.00. He asked me to deliver it to his office as soon as possible. Promptly at noon the next day, Tuesday, the sheet was delivered to Mr. Klein at his office in Philadelphia, receiving a certified check in payment. 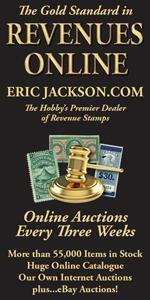 Thus, within one week, stamps that originally cost $24.00 were sold for a profit of $14,976.00. Later, the entire sheet was sold to Col. E. H. R. Green, the first party I tried to contact in New York, for $20,000.00, who at the request of Mr. Klein decided to have compassion on his fellow stamp collectors and give them an opportunity to also obtain some of these stamps. He realized that by keeping the entire sheet it probably would never be worth much more than he had paid for it. He further realized that breaking the sheet would enhance the value of the stamps and that he would be able to get his money out of it in time. Col. Green kept a block of eight showing the plate number at the bottom. This is the largest block in existence. He also kept the center line block, and the two arrow blocks, twenty stamps in all. From the time I sold the sheet until this past summer, I had never seen one of these stamps. Then, Mrs. Ethel B. Stewart, [Editor’s Note: Later to become Mrs. Ethel B. McCoy] a widely-known collector from Newton, New Jersey, who owns a block of four, was in Washington and I had the pleasure of meeting her. Mrs. Stewart had her stamps with her, and once again I had in my hands part of the original sheet that I had purchased for $24.00. The Collectors Club, of which I am a member, was having a meeting that evening and I invited Mrs. Stewart to accompany me to the meeting. She accepted my invitation and took her stamps with her. Mrs. Stewart very graciously exhibited these stamps and there were many present that evening who had never seen any of the stamps before. In conclusion, I would like to set at rest some of the many rumors that exist about these stamps. The first, that a man in line ahead of me turned the stamps back to the clerk at the window because they were not perfect. This is absolutely false, for at the time that I made my purchase there was no line and no one was ahead of me at the window. Can you imagine the post office trying to resell a sheet of stamps that had been once refused for being imperfect by having the airplane upside down? Next, that this sheet was not a full sheet, as nineteen of the stamps had previously been purchased by another collector. This is also untrue, as this sheet was intact until after it was sold to Mr. Klein. Thus, after nearly twenty years, I have found time to write in detail all of my experiences in connection with the purchase and sale of one of the rarest of philatelic gems. I sincerely trust that the present and future generations of stamp collectors will find much of interest in this, the only true and authentic history of the 24-Cent airmail stamps with the center inverted.